In the weeks that followed Anthony Bourdain’s death on June 8th, 2018, Twitter feeds, newspapers, and Instagrams were flooded with celebrity memorial posts. This is something that happens often in our world, over-saturated as it is with death and violence. But these posts were not the prayers and wishes that we’ve come to associate with such tragedies. They told real, human stories, from people near and far, across all walks of life, about this figure that touched so many people’s hearts, minds, and stomachs. Bourdain’s best friend, French-born chef Eric Ripert, called him “one of the great storytellers,” and indeed he was. Anthony Bourdain’s rise to fame in 2000, with his book Kitchen Confidential, painted the narrative of the tough, lovable, foul-mouthed pirate who we would come to know and love on our television screens. Beautifully and equally profane and profound, Bourdain didn’t just unearth the rough interior of the culinary world, he brought attention to the drugs, alcohol, sexism, and labour that goes on behind the kitchen doors. One of Bourdain’s greatest strengths as a writer, a traveler, and a television host — alongside his brilliant wit, of course — was that he never shied away from the truth, ugly or not. The kind of realism that Anthony Bourdain projected was a refreshing change from other reality TV, a change that viewers welcomed. What viewers did not expect, however, was the way “Tony” opened his heart, both to us and to the countries he visited. He knew what questions to ask, and equally important, how to step back and listen. He brought attention to hidden corners of the world: to backyards, gourmet kitchens, and grandma’s dinner table. Most of all, he taught us the deeply rooted connection between food and culture, family, and soul. Take, for example, Hawaii, an archipelago whose food acts as a microcosm of the blended cultures that live there. In an episode of Parts Unknown exploring Hawaii, Bourdain talks to chefs, locals, expats, and immigrants. He visits the notoriously insular island of Molokai to consider sustainable fish farming and the protection of precious resources. He joins Shep Gordon’s backyard luau and contemplates family, friends, and the concept of paradise over pork cooked in banana leaves. Somehow this all makes sense: the flavors of native Hawaiians and immigrants from the Philippines, China, Japan, Vietnam, and Okinawa, blend with American and American-Mexican food among the spread of pork, fish, octopus, spam, macaroni salad, chicken katsu, and dozens of other treasures. This bounty wouldn’t exist among any less a unique blend of cultures. Bourdain highlights these significant complexities in every culture, wherever he goes, considering culture, influence, politics, and history. In the years following the publishing of Kitchen Confidential, Bourdain leaned away from the hypermasculine swashbuckler he once was and began using his platform for social causes. He became involved in the #MeToo movement, calling out sexism within his own culinary industry, as well as taking stances on politics, immigration, and the refugee crisis. These are topics we wouldn’t normally expect from a food and travel show, but Tony pushed them forward anyway, attempting to paint a fuller, more human picture of the parts of the world that television leaves largely unexplored. 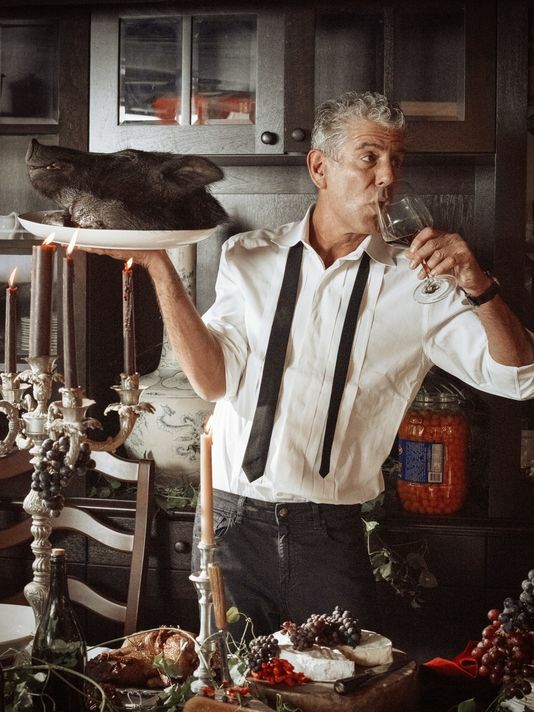 Indeed, Bourdain often showed us his own humanity, letting his audience in on stories from his bad boy past, inside jokes, and friendships, including his charming relationship with Eric Ripert, the straight man to Tony’s sarcastic wit, whom he banters with on screen over cheese, seafood, and increasingly hot Sichuan peppers. All of this makes his death all the more heartbreaking. The legacy he has left is one that remembers him as a fierce defender of laborers, immigration rights, gender equality in the restaurant and food industry, drug policy reform, and above all, humanity. His sardonic humor always makes me smile, but even more so does the pure bliss of traveling, meeting new people, trying new things, and opening one’s eyes to the world around us that Bourdain brought to our screens and to our hearts.